Timofey Radya's Figure #1: Stability received the NY Artist Prize at the Cutlog Art Fair held in New York. Figure #1: Stability was modeled on an original created in Yekaterinburg in December of 2012. Made from 55 police riot shields, the original resembles a house of cards with a throne at the top. Timofey Radya says it shows his vision of Russia’s current government – based on force, but able to be brought crashing down like a house of cards. The Yekaterinburg native earned a degree in philosophy before taking up street art. “When you study philosophy, you understand that there are many things which seem simple enough, but are hard to keep at the front of your mind. They can be simple yet important ideas, which require suitable expression. The creative process is very organic; it takes strength to do it, as it involves danger and passion, and it constantly nourishes you. It forces you to think about things like how people are organized, what they find interesting?” muses Timofey in an interview for Look at Me. Timofey rose to notoriety in Russia for his graffiti Forward – Defend painted on a Yekaterinburg high-rise building. “Wall inscriptions are an ancient, eternal form. I’d say there’s a common emotion that unites inscriptions of all ages,” he explains. His portraits of soldiers, created out of flame, established him as a street artist all over the world. In the center of Yekaterinburg, on the walls of an abandoned WWII hospital, Timofey's team decided to paint the soldiers' faces. They transferred photo images to gauze bandages, and the differing thicknesses of bandaging lent different shades of color to the image. Afterwards, the bandages were burned. The project was organized for June 22, the longest day of the year, and the day on which the USSR entered WWII. 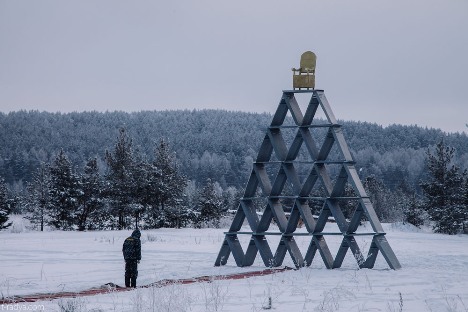 Timofey Radya has been nominated for the Innovation State award for contemporary art, given annually by the National Center for Contemporary Arts. In 2011, the award was won by the controversial art-group Voina (War).